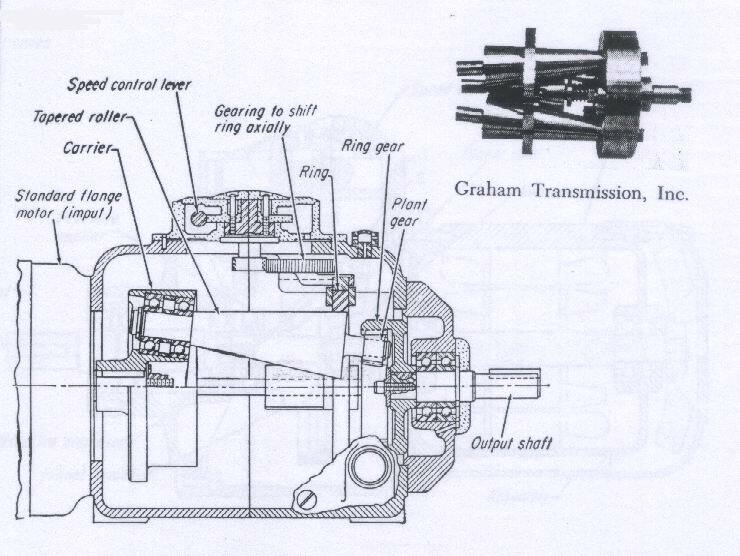 The Graham variable-speed transmission is a compound planetary drive in which the positive contact between the ring gear and one end of the compound planet gear has been replaced by rolling contact between a reaction, ring and a tapered planetary roller. The axial position of the reaction ring determines the effective diameter of the planetary roller and, thus, the speed ratio of the drive. 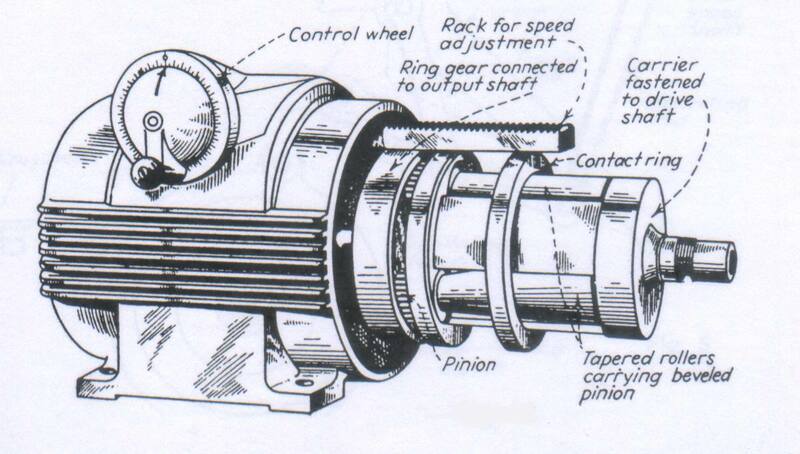 The planet carrier is driven by a constant-speed motor, and the centrifugal force on the planetary rollers supplies the traction pressure between the rollers and the ring. Two types are available. The standard (nonreversing) types give output speeds ranging from a maximum of approximately one-third input speed in the same direction, through zero, to approximately one one-hundredth input speed in reverse. The B (reversing) types give equal speeds of approximately one-fifth input speeds both sides of zero. Built-in reduction or step-up gear trains are normally used to give a wider range of maximum output speeds. Capacities range from 1/15 to 5 hp at 1,750-rpm input speeds, and drive efficiencies range from 65 to 85 percent, depending upon the size of the unit. Fundamentals of Mechanical Design. Third edition, 1975. Author : Richard M. Phelan. Published by McGraw-Hill, New York, USA. 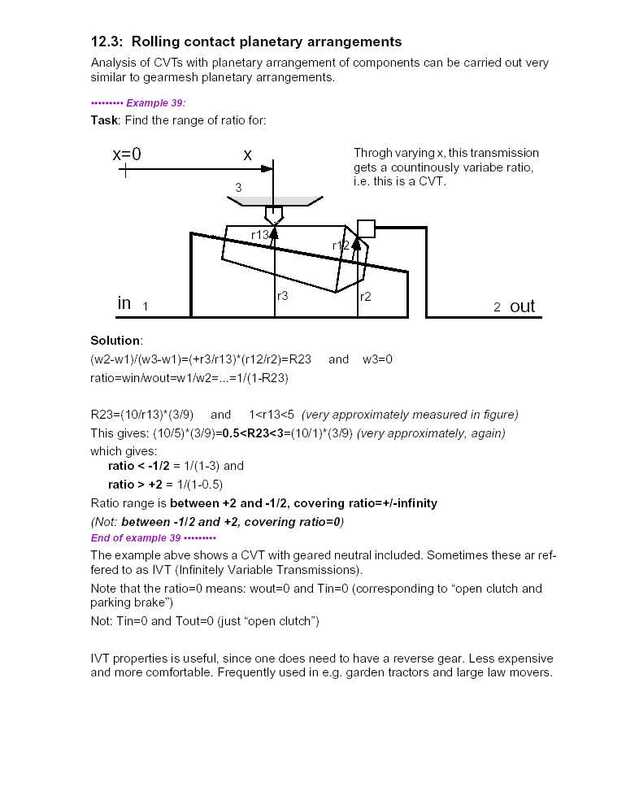 Automotive Power Transfer & Management, Lecture Notes. 2000. Author : Bengt Jacobson. Chalmers.